Your graduate work was on bacterial evolution, but now you're lecturing to 200 freshmen on primate social life. You've taught Kant for twenty years, but now you're team-teaching a new course on "Ethics and the Internet". The personality theorist retired and wasn't replaced, so now you, the neuroscientist, have to teach the "Sexual Identity" course. Everyone in academia knows it and no one likes to admit it: faculty often have to teach courses in areas they don't know very well. 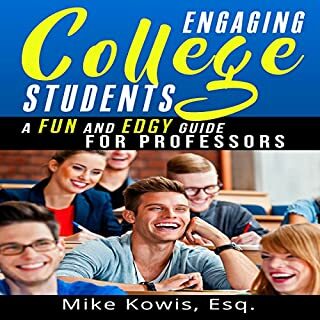 In this amusing and multiple award-winning how-to guide for professors, seasoned instructor Mike Kowis shares 44 college teaching tips that will help any teacher. This brutally honest audiobook is based on the many lessons that Mike learned during his 15 years of teaching, and it's filled with dozens of hilarious - and often embarrassing - anecdotes. 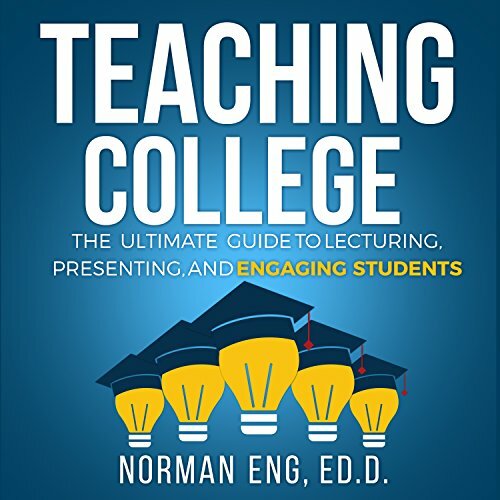 Engaging College Students: A Fun and Edgy Guide for Professors will help you fully engage your students in classroom discussions. Each year tens of thousands of students will, after years of hard work and enormous amounts of money, earn their PhDs. And each year only a small percentage of them will land jobs that justify and reward their investments. For every comfortably tenured professor or well-paid former academic, there are countless underpaid and overworked adjuncts and many more who simply give up in frustration. 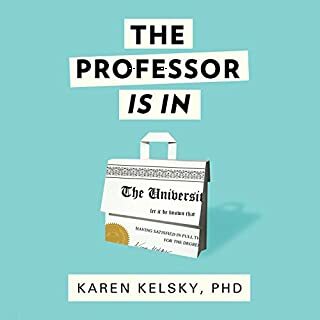 Karen Kelsky has made it her mission to help job seekers join the select few who get the most out of their PhDs. Whether your classroom consists of 3 students or 300, it’s important to be as effective a teacher as possible, both for your students and for your own professional and personal growth. 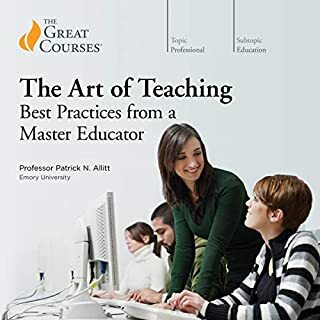 The Art of Teaching: Best Practices from a Master Educator is designed to help you achieve new levels of success as a teacher. 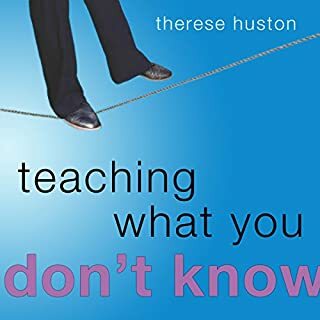 These 24 lectures will help you develop and enhance your teaching style; provide you with invaluable methods, tools, and advice for handling all manner of teaching scenarios; and open your eyes to how other teachers think about and approach this life-changing profession. 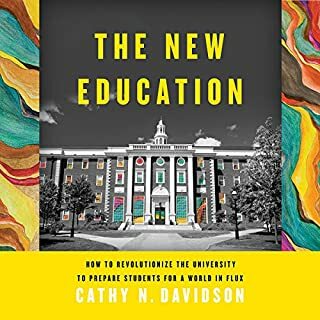 Our current system of higher education dates to the period from 1865 to 1925, when the nation's new universities created grades and departments, majors and minors, in an attempt to prepare young people for a world transformed by the telegraph and the Model T. As Cathy Davidson argues in The New Education, this approach to education is wholly unsuited to the era of the gig economy. Do you dream about increased student engagement and more effective classroom management? How about reducing teacher stress and the feeling of being overwhelmed? Or leaving campus at a reasonable hour without dragging a cart full of lesson planning and papers to grade? If the answer to these questions is “Yes!” then this audiobook is for YOU! 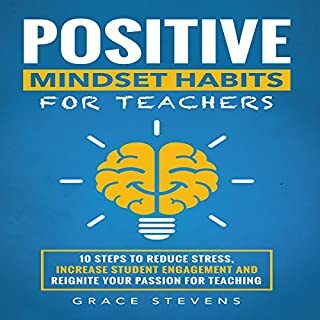 Based on current research in positive psychology and more than 15 years of “real world” experience in the classroom, this book provides a map to reduce stress, improve student behavior, and be happier in your classroom and your life. Boils down to "be a joy detective." To most of us, learning something 'the hard way' implies wasted time and effort. Good teaching, we believe, should be creatively tailored to the different learning styles of students and should use strategies that make learning easier. Make It Stick turns fashionable ideas like these on their head and will appeal to all those interested in the challenge of lifelong learning and self-improvement. This groundbreaking inspirational manifesto contains more than 30 hooks specially designed to captivate your class and 170 brainstorming questions that will skyrocket your creativity. Once you learn the Teach Like a Pirate system, you'll never look at your role as an educator the same again. Taking listeners behind Apple's major research studies, Apple Classrooms of Tomorrow (ACOT) and ACOT2, this audiobook highlights the powerful effects of the Challenge-Based Learning (CBL) framework and also introduces some of the extraordinary parents, educators, and entrepreneurs from around the world who are already utilizing new science-backed methods and technologies to benefit all children, from those who struggle to honor students, to help them unlock their potential and empower them to reach beyond their perceived limitations. Colleges and universities constitute a special type of organization; and their complex mission, dynamics, personnel structures, and values require a distinct set of understandings and skills to lead and manage them well. In Reframing Academic Leadership, Lee G. Bolman and Joan V. Gallos offer higher education leaders a provocative and pragmatic guide for crafting dynamic institutions where the whole is greater than the sum of the parts, Creating campus environments that facilitate creativity, and more. What does university teaching - as a craft - look like? What changes does a craft perspective suggest for higher education? The Craft of University Teaching addresses these questions in both a general sense: what does the act of teaching become when treated as a craft? What changes to a professor’s educational philosophy does it require? And with respect to the practical, everyday tasks of university professors, such as the use and misuse of technology, the handling of academic dishonesty, the assignment of course reading, and the instilling of enthusiasm for learning. Mindful Teaching and Teaching Mindfulness emphasizes how the teacher's personal familiarity with mindfulness plants the seed for an education infused with attention, awareness, kindness, empathy, compassion, and gratitude. The book follows a teacher from morning to night on a typical school day, at home, during the commute, and before, during, and after class. Teach Like a Champion 2.0 is a complete update to the international best seller. This teaching guide is a must-have for new and experienced teachers alike. More than 700,000 teachers around the world already know how the techniques in this audiobook turn educators into classroom champions. With ideas for everything from classroom management to inspiring student engagement, you will be able to perfect your teaching practice right away. From how to set up an easy-to-use classroom management plan to how to handle difficult students, The Classroom Management Secret will equip you with everything you need to effectively manage your classroom, regardless of where you teach or who shows up on your roster. Based on the popular blog, Smart Classroom Management, the book progresses step-by-step through 45 time-tested strategies, showing you how to manage your classroom in a way that inspires students to want to behave. To close the achievement gap, diverse classrooms need a proven framework for optimizing student engagement. Culturally responsive instruction has shown promise, but many teachers have struggled with its implementation until now. In this audiobook, Zaretta Hammond draws on cutting-edge neuroscience research to offer an innovative approach for designing and implementing brain-compatible culturally responsive instruction. Your students aren't reading. They aren't engaged in class. Getting them to talk is like pulling teeth. Whatever the situation, your reality is not meeting your expectations. Change is needed. But who's got the time? Or maybe you're just starting out, and you want to get it right the first time. Secrets like "focusing on students, not content" and building a "customer" profile of the class will change the way you teach. The author, Dr. Norman Eng, argues that much of these approaches and techniques have been effectively used in marketing and K-12 education, two industries that could greatly improve how college instructors teach. Find out how to hack the world of higher education instruction and have your course become the standard by which all other courses will be measured against. Whether you are an adjunct, a lecturer, an assistant professor, or even a graduate assistant, effective teaching is within your grasp. Anyone who has gone to university has likely sat through some really bad lectures. Dense slides. Too much content. Hour or more of the lecturer talking, with no interaction. Poor structure. Teaching at a level beyond the audience. Norman Eng has put his many years of experience teaching into this books, giving great guidance as to how to improve lectures and teaching in general, and to avoid giving the bad lectures. Eng shows studies that prove that much of what if taught in long lectures is lost – with attention spans disappearing after 20 minutes at most. He then presents ways to avoid this. While simplify the content of the book down really doesn’t do it justice, the book can be boiled down to (it you really had to) two main concepts: “know your audience” and “teach like you would for K-12 students”. For kids and teens teaching is interactive, engaging, varied and usually done in short bursts broken up by activities. And yet once you are out of university we are suddenly expecting students (who might only be 1 year different to a high school kid) to sit through and hour plus of talking and pick up everything that is said. The “knowing your audience” is about pitching it to their level, explaining it in ways that are relevant and making sure that the students are engaged rather than seeing it as abstract concepts. While I am not a university lecturer, I have done some lecturing previously and regularly do presentations at work. And the content of this book is useful there, beyond the scope of just “teaching college”. The book also has an “about the author” right up front, explaining his history and experience. I really appreciated this as it told me where Engwas coming from and why what he taught in the book would be trustworthy. The narration by Joseph Brookhouse is good. Clear, crisp, well-paced. He does a good work covering the topics and conveying the information within. No glaring issues at all with the narration or audio production. Based on my own experiences as a post-secondary educator, I would suggest that you shouldn't feel like you need to follow all of the tips in this book (there are so many good ideas, it would be overwhelming to try to adopt all of them at once). However, if you follow at least some of them you will become a better educator. Even minor changes can result in major improvements (from a student engagement perspective). If you're as engaged with the students as you want them to be engaged with you, then you'll be able to detect what works and what doesn't work when you teach. Don't expect perfection right away, adopt a continuous improvement approach to your lessons, and enjoy the high that you feel at the end of a really effective class (it helps offset those days when students don't seem to find any of your jokes funny!). Anyway, this book was an enjoyable read. Even if the material is familiar to some readers, it's never a bad idea to think about one's philosophy of teaching and consider how that philosophy translates into practice. I provided my opinion in exchange for a complimentary copy of the audiobook from the author, narrator, or publisher. I've been a college professor at the university level for 16 years, and am always looking for resources to improve my teaching, better reach my students, and help them retain material in creative, practical ways. This book was very helpful for all those reasons, and more. I plan to go through the audio book multiple times and make a list of the many suggested teaching techniques Eng covers. For a relatively short audiobook, this book is EXTREMELY useful. There is a strong encouragement towards fragmented and variable class time usages so as to keep attention and use of the Socratic method style. There are many examples of HOW to implement the techniques, evaluate and receive feedback. If you teach, at all, LISTEN TO THIS. It is worth every minute. The 'what', 'why', 'how' and even 'when' are all included! I have repeatedly observed, in grad school, graduate students thrown into TAing courses alone without much advisement (myself included) and new professors flounder while trying to experiment with teaching for the first time. In college, many teachers are Not given any advise as to how to teach. This will alleviate the common problems of the classroom quickly and provide understanding on all fronts! The first thing I noticed was the expectation of engagement between the instructor and the students. Also, prominent is the various methods used to sustain interest and involvement with the differing types of learning taking place among the group. Great perspective and insight is provided using pedagogical applications with higher educational methods. Exactly What I Needed to Prepare for Teaching! As a newly hired lecturer, I found this book to provide tons of helpful tips and things to consider in planning for an engaging course that makes a difference in students' careers. Eng's tips have given me structure and confidence as I develop lessons and activities for learning. Thank you Norman! Great for all teachers in the schools or in their fields at any level. Teaching college isn't a book that lots of people have heard about, but that surely isn't fair in light of such wonderfull tips that the book provides. It's an essential book for those who intend to teach, not only on the higher education as the title shall sugest, but it can be quite usefull for those who work with lectures and workshops. The narration by Joseph Brookhouse is adequate to the context of the book, making it an easy listen with no major problems. Thank you 😊 Listening over and over! Also applying much of it in my class sessions.